A 5/3 fullsuit wetsuit is a full on winter cold water bring it on wetsuit. It can come in two variations – 5/3 and a 5/4/3 (some new models also have a 0.5mm thickness like 5.5/3.5). The numbers 5/3 and 5/4/3 represent the thickness of neoprene used in this wetsuit. 5 stands for 5 millimeters, 4 stands for 4 millimeters, and 3 stands for 3 millimeters. This means that a 5/4/3 wetsuit is made from neoprene of three different thicknesses and a 5/3 wetsuit is made out of neoprene of two different thicknesses. Thicker neoprene is usually used on the body and legs and the thinner is used on the arms and crotch area. The reason for this is improved flexibility of the wetsuit. Thicker neoprene keeps your core warmer while thinner neoprene allows for more flexibility where you need it. There is not much difference between 5/4/3 and a 5/3 wetsuit (newer models are usually 5/3) so get one that fits you best. This is a full wetsuit – a wetsuit that covers your whole body except your head, hands and feet. If you combine your 5/3 with thick wetsuit boots (at least 5mm), wetsuit gloves and a neoprene hood you can use it anywhere down to 45F (7C). This is not a firm number though; there are many things that influence at what temperature a wetsuit can be used so check our wetsuit thickness and water temperature guide to find out more. Also if water so cold is the water temperature that you will mostly surf, you do not want a wetsuit that has its bottom limit at that temperature. Get a thicker one. How to buy a 5/3 winter wetsuit? Stretchy neoprene – 5 mm neoprene is quite thick and will slow you down while paddling, so get a wetsuit that is made out of stretchy elastic neoprene to make it more flexible. Blind stitches – you want a blind stitched wetsuit – one that is sewn together using blind stitching technique. Using this type of sewing the needle never fully penetrates the neoprene which means there are no holes that go all the way through your wetsuit and no holes for the water to come in. Sealed seams – seams need to be sealed by liquid taping, liquid sealing (there are different names for this)… Sealed seams are “100%” waterproof and a wetsuit with that kind of seams will be quite warmer than one without them. 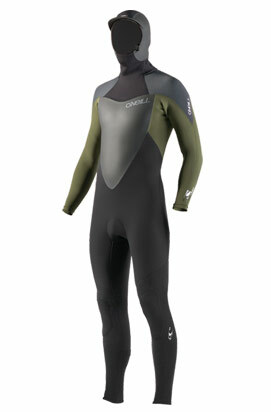 A must in winter wetsuits! Extra insulation – look for some sort of thermal lining on the inside of the wetsuit. Zipper – a specially designed zipper teeth that are better at stopping water or a shorter zipper means less water in your wetsuit through the zipper. Batflap, batwing – a thin layer of neoprene under the zipper that stops any water that comes through the zipper and redirects it back out through the hole at the bottom of the zipper. When you get to thick winter wetsuit models you will find that some of them will have an integrated wetsuit hood. Integrated hood is one that is already attached to the wetsuit and it can’t be taken of. If you get a separate hood you can put it on or take it off at will. So why get a wetsuit with an integrated hood? Because it is warmer! You just have to decide if you will need the hood most of the times you will be using your wetsuit. If you will, then get one with an integrated hood. I just was given a Roxy Cypher 5,4,3 with an integrated hood. I wanted to know if you can were the wetsuit without using the hood. Or can I have it altered and have the hood removed. Antoinette, if it’s not made to be removed then it’s better to leave it as it is. You could give it to some wetsuit repair shop to have it removed, but I’m not sure how this would work since the neck seal is very important. I am not so familiar with this model, I suggest you talk to the guy who would do the repair and see what he thinks can be done. There is no reason that you HAVE to wear the wetsuit.. As far as getting the wetsuit altered, I don’t see why not, probably would be simple to cut it off and stitch it up. Oops.. I meant there is no reason that you have to wear the hood. unless it is very cold. hi i have two sons who regularly surf in 10degree water.I looking for 5mm steamers with built in hoods sizes 8 and 10.Any suggested makes?